Favorite Line: [After defining the terms in the poem Waltzing Matilda] Why the swagman is a-waltzing with his bedroll and why above all he desires someone or something (in the second verse it's a sheep, for goodness' sake) to join him in this bizarre and possibly depraved activity are, of course, questions that cannot be answered. With the Olympics approaching, books on Australia abound. Still, Bryson's lively take is a welcome recess from packaged, staid guides. The author of A Walk in the Woods draws readers in campfire-style, relating wacky anecdotes and random facts gathered on multiple trips down under, all the while lightening the statistics with infusions of whimsical humor. 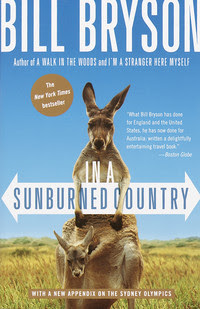 Arranged loosely by region, the book bounces between Canberra and Melbourne, the Outback and the Gold Coast, showing Bryson alone and with partners in tow. His unrelenting insistence that Australia is the most dangerous place on earth ("If you are not stung or pronged to death in some unexpected manner, you may be fatally chomped by sharks or crocodiles, or carried helplessly out to sea by irresistible currents, or left to stagger to an unhappy death in the baking outback") spins off dozens of tales involving jellyfish, spiders and the world's 10 most poisonous snakes. Pitfalls aside, Bryson revels in the beauty of this country, home to ravishing beaches and countless unique species ("80% of all that lives in Australia, plant and animal, lives nowhere else"). He glorifies the country, alternating between awe, reverence and fear, and he expresses these sentiments with frankness and candor, via truly funny prose and a conversational pace that is at once unhurried and captivating. Peppered with seemingly irrelevant (albeit amusing) yarns, this work is a delight to read, whether or not a trip to the continent is planned. Let me just start by saying that I adore Bill Bryson. Or, more likely, I want to live his life. People who know me well know that I believe Rachel Ray leads the ideal existence, traveling around the world and eating. But Bill Bryson has a pretty storied existence as well, traveling around the world and then writing hilarious anecdotes about where he has been. I can only read his books when I am quite sure that I will be visiting the places he describes, however- he has the tendency to make one jealous. Travel writing has been popular for a very long time, and I don't think it will lose the public interest any time soon. At least, not with Bryson at the helm. I read this book on morning and evening commutes and my snickers and snorts of laughter brought me weird looks- until the bibliophiles among me smiled and nodded (I actually made that smile and nod for a fellow CTA passenger who was reading Terry Pratchett- also a dangerous author to read in public). The man is funny. And he litters his books with moments of great insight as well. In a Sunburned Country is a book about Australia (Pratchett coincidentally also tackles this country in The Last Continent). Bryson makes great efforts to travel all over this country and fails (well, fails in that it's a very LARGE country to see and cover in the course of a few visits totaling probably a month's worth of time). For instance, Bryson spent very little time in the cities- which is where most people visiting Australia would probably focus their time, and spent a great deal of time in the emptiness of the Outback. But the Outback, even if it cannot be visited, does intrigue and entrance and it's great fun to read about the explorers who trekked across it, and the Aborigines who somehow settled it, and the animals that still populate it. The book also touches, albeit with a very light touch, the Aboriginal story in Australia. It's one that is just as heartbreaking as that of America's native population. Bryson refers to the Aborigines as "lost," which is a very bleak and depressing picture when you consider that they were a ridiculously advanced civilization, more than 60,000 years ago- 30,000 years before anyone else thought to traverse on a boat to an island. However, Bryson's books can't be depressing for long and after musing on his inability to solve the Aboriginal problem (which, I think, countries around the world are facing, though perhaps not with the gusto they should be), he turns to happier things. Like his story about the building of the Sydney Opera House, about Canberra's failed plan as a city, about meeting an echidna, about almost drowning in the Great Barrier Reef and about the majesty of Ulluru. If you're one of those people who thinks that Australia is just like the United States, then this book proves you wrong- the natural wonders of Australia alone are enough to draw your attention. And the friendliness of its locals, the bizarre nature of its history (and it's bizarre, I tell you) and, not to forget, the deadliness of its creatures draw Bryson's attention, and will draw yours as well. Even if you don't plan a visit, this book's a keeper. Actually, I was referring to Canberra - I've only been in Brisbane four years. It's a shame that Bryson missed Brisbane; he'd have found plenty of oddities of write about up here! Oh, yes, he had much to say about Canberra (none of it very nice, I'm sorry to say). I don't remember hearing much about roundabouts, though, so maybe those escaped detection! Hmm . . . I guess when I do finally read it, my review will be livened up with some righteous indignation! Another Bill fan, here! This is one of his that I haven't read (Neither Here Nor There is the other one), but it's on my TBR shelf. I'm not much interested in Australian but if anyone can make me, it's him. I wish he'd write another travel book soon.